Mortal Fire takes its title from a phrase in one of William Blake’s ‘Songs’, two stanzas of which form the epigraph for this uncanny new novel by Elizabeth Knox. It seems to me that Blake is the perfect literary spirit to invoke – an inventor of mythologies, a poet whose work dealt in the visionary and grappled with the idea of the soul, which is perhaps an old fashioned way of figuring out how we might weave our sense of an immaterial world into the fabric of our daily, grinding lives. Elizabeth Knox’s books brim over with a sense of the immaterial, of worlds and things beyond that which we can touch. It is also true that her books contain living breathing characters that keep us firmly rooted in their worlds, characters that call out to us to keep up with their smart, fast-turning stories. Elizabeth is a writer concerned with the mythologies we make about our origins and ourselves; she is a writer who dares to create her own. 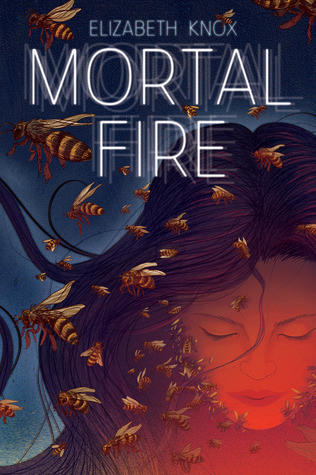 Mortal Fire is a book full of the elemental – of bees and golden honey, of apples and rain, wax and fire and, of magic, which is embedded deep within the fictional republic of Southland. The book is a return to Southland, a country that the readers of the Dreamhunter novels know well. Southland is a place where Elizabeth Knox’s mythologies – those that her and her sister Sara have been working on together since they were young – take shape and are borne out on the page. With the addition of Mortal Fire to the mythologies of Southland, Elizabeth shows us that there is space for a great many stories within its boundaries. The action takes place in the enchanted rural idyll of the Zarene Valley, home of three strange Zarene elders and a horde of young children who have rhyming names and tattoos on the inside of their forearms. The people in the nearby town are wary of the Zarenes and the Zarenes are wary of visitors. When our heroine Canny, her brother Sholto and his girlfriend Susan arrive, they are questioned about their lineage and reluctantly allowed to stay on as guests. Thus unravels the terrible secret the Zarenes have been hiding for years. Mortal Fire’s heroine, Canny, is a practical and determined person, a sixteen year old girl whose thick black hair splays out like smoke when she’s thinking hard, a mathematical genius who is ‘always surprised at the many more steps it takes other people to do things just because they didn’t think it through first’. Because of her genius with numbers, because she has spent her sixteen years living in the shadow of her fierce mother’s heroic deeds, because of her brown skin and the uncertainty of who her father is, Canny is an outsider who is told she must try harder to fit in. But Canny cannot ‘fit in’. It is not simply a matter of her Pacifica heritage; she senses something that other people don’t – the Uncanny butting up against the material world. She is a character who holds our attention right from the start. It is the smart, frustrating, funny, quick-witted Canny who holds our hand as we turn the page, shouts Keep Up! as she figures out how the magic of the Zarene Valley works, and what indeed that magic is. There is at the heart of this book a big idea, a concept that is complex and formed in 3D. I imagined Elizabeth taking the idea of magic, suspending it in her mind and examining it from every angle – does it work if this happens, or if I make the characters do that? In Mortal Fire magic is not a borrowed idea, something that witches and wizards wave a wand at and command, but something wholly formed from what I think of as an ‘Elizabeth’ point of view – a complex, detailed, knotty, and intensely satisfying idea that somehow feels of the earth, so that you might almost believe it is real, an idea that keeps you trying to unravel it alongside Canny until the novel’s final page. Like breadcrumbs to the hungry, those readers who venture alongside Canny into the forest of the Zarene Valley and up into the hidden house on Terminal Hill are fed pieces of a grand puzzle to put together. Mortal Fire is a book about families – the Zarenes are a family being slowly ruined by their own power and by their inability to forgive; Canny’s family constantly miscommunicate with each other, misunderstand each other and sometimes, actively mislead each other. The book treads some complex moral ground – how long should we make the guilty pay for their ill deeds, how do we forgive those that kill? So there’s magic and morality, but it is also a love story. Plain and simple and satisfying on one level in the way we like a love story to be, love is also the glue that binds the elemental, the immaterial magic to the real people and objects of Mortal Fire’s world, it is the true magic of this story. It is, in Blake’s words, ‘more than mortal fire’, and while love might not be able to save everyone in the book it makes it possible for some to carry on living. I’m very excited to launch Elizabeth’s latest fiction and I’d like to congratulate her on making another fine addition to her body of work, and to the Southland mythologies. I’d also like to mention and thank Gecko Press for daring to take on their first young adult book. It’s an exciting book, an immersive reading experience, and I’m launching Mortal Fire certain that it will find a hungry readership among both teenagers and adults, among people who love magic and a damn fine yarn. Thanks Mary, hope you enjoy the book.